Today, the master bath suite is more than just an afterthought in home design. Modern master bathrooms are architecturally pleasing spaces. The bathroom is an exquisite hideaway where you can soak the day’s troubles away. 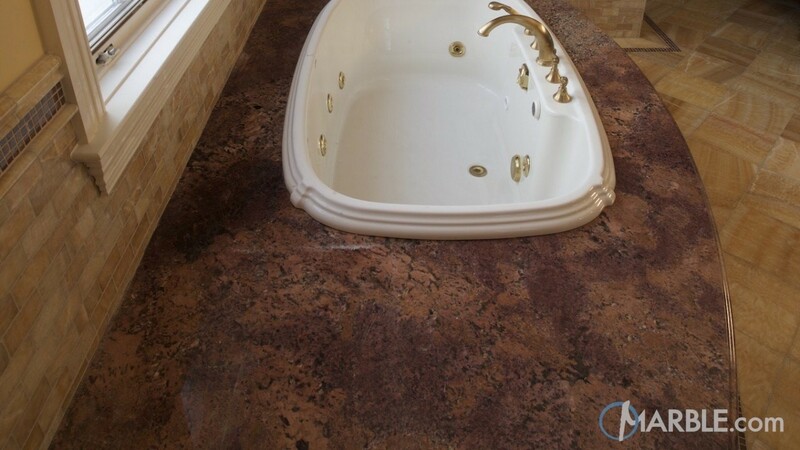 A natural stone bathtub surround provides an elegant and luxurious addition to any bathroom. The use of stone in vanity tops and bathtub surround allows you to bring nature into space and create a respite from the hectic pace of daily life. Whether the tub is in a corner, or against a wall, a surround helps to protect the wall and finish the space. The natural stone industry offers a wide variety of stone colors and types for bathroom surrounds. Choose from onyx, travertine, marble, and granite natural stone bathtub surrounds in colors that range from neutral to bold. Marble – This is among the more porous and delicate types of natural stone. 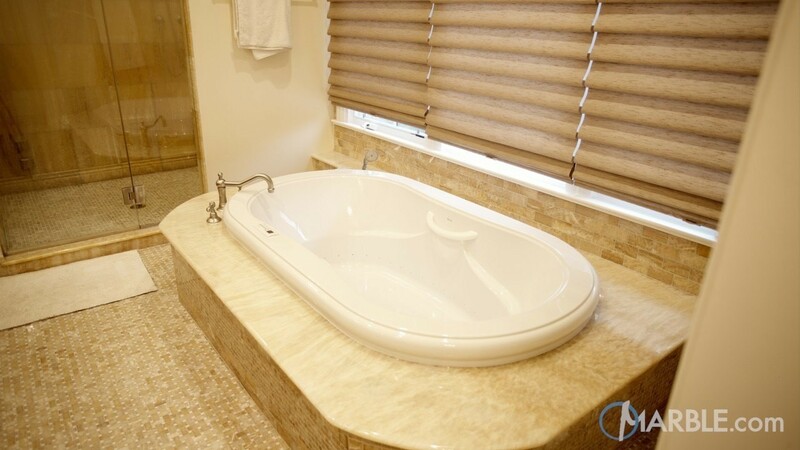 Due to the porosity, marble is not suitable for high traffic areas, but perfect for a bathtub surround. A marble surround adds a touch of elegance with color options that range from white to even black. The neutral tones of marble allow you to easily change the colors in your bathroom whenever you feel the desire to update your space. Onyx – The beauty and unique style of onyx have made this type of stone popular since antiquity for everything from carvings and jewelry to home design. An onyx surround is a distinctive addition to any bathroom. The dramatic veiny patterns add an artistic quality to bathroom design. Travertine – Travertine is a softer natural stone that is not suitable for high traffic areas, but perfect for a bathtub surround. This stone offers natural elegance and the range of color variations and patterns makes it easy to find a travertine surround to suit the style of any bathroom. The natural matte finish of this type of stone makes it suitable for a wide range of design styles, from rustic to modern. Travertine is easy to clean and doesn’t show water marks, making this stone perfect for a tub surround. 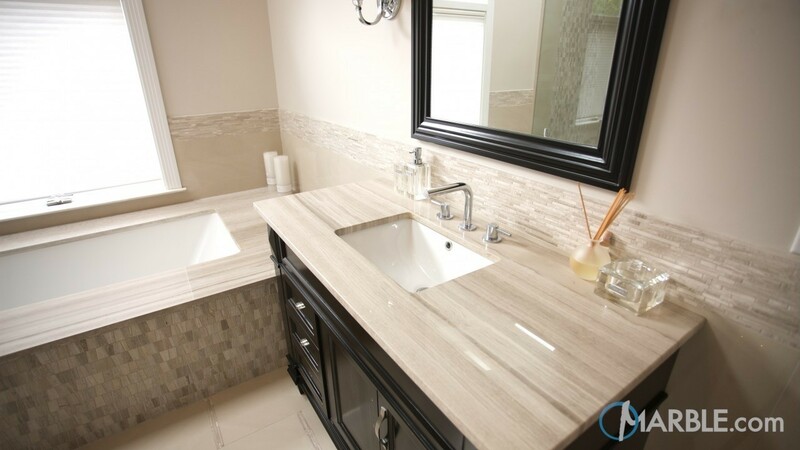 Granite – If you want to create a spa-like atmosphere for your bathroom renovation, granite is an excellent choice. Granite is available in a wide variety of stone colors with flecks and spots. Neutral tones, such as white, grey, black, and beige are a good choice if you like to change the look of your bathroom often. Do you want more color in the bathroom? Granite is available in blues, greens, and many other shades to provide the perfect stone bathtub surround for any style or color preference. Be sure to seal the stone to protect it from moisture and keep it looking like new. Stone colors can vary widely among slabs, so the picture you see online may not be exactly what you will get. It is a good idea to visit one of our slab yards to find a natural stone slab that is perfect for a granite surround, onyx surround, or travertine surround for your bathroom. Consider the color options and type of stone to select a surround that will best fit the architectural and interior design style of your home. Whatever your choice of natural stone, Marble.com can make your design dreams come to life. We have more than 2,000 stone colors that you can choose from to make your bathroom a haven that you won’t ever want to leave.